Vredelust B&B is a charming retreat in the beautiful village of Villiersdorp. Accommodation is within walking distance to town and situated near the Theewaterskloof Dam (7th largest in South Africa). 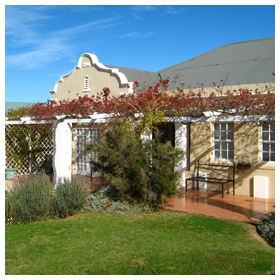 Comprising three en-suite double bedrooms and four self-catering units. All rooms have DSTV, tea and coffee making facilities. Braai/ barbecue in the garden. Secure parking provided. The quaint self-catering units consist of an open plan double bedroom with fully equipped kitchenette. Breakfast is served from the dining room adjoining a sitting room where guests can also relax. Find out more here.. Explore the beautiful countryside surrounds of Elgin and Villiersdorp. The Theewaterskloof dam is ideal for boating and water sports enthusiasts. Things to do and see in Villiersdorp. Group events and dinner parties. and 43km from Worcester. More on Villiersdorp Accommodation ..
Villiersdorp and its friendly people.